Morning Oregonian, July 5, 1914. Here's a piquant lost chapter from Chicago's LGBT history. 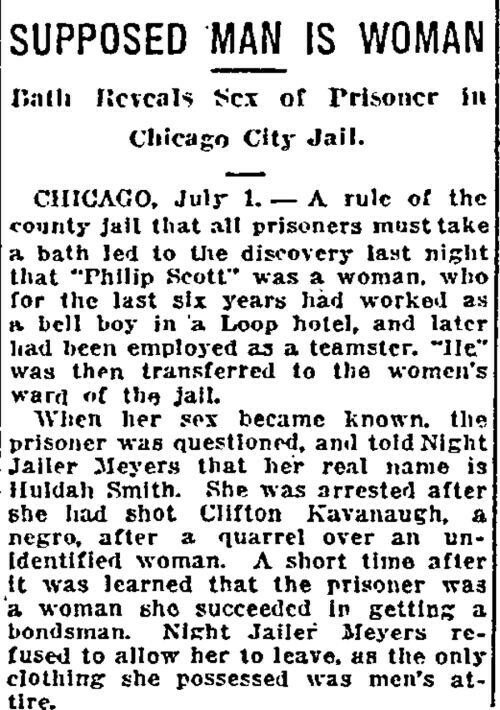 Cross-dressing was a crime at this time, hence Night Jailer Myers's refusal to honor Philip/Huldah's bail bond on the grounds of attire. It's impossible to know how many women were passing as men in any given era, because even if you toted up all the stories like this, it wouldn't cover those cases that never came to light. Anyway, it's a feature of American life that dates back to earliest colonial times. And of course, the further back you look, the more incentive women had to reinvent themselves as dudes.